Netta B Sutherland daughter of Donald Sutherland hotel keeper Latheronwheel accidentally killed while cycling 16th July 1909 aged 15. Father Donald Sutherland died 7th January 1917 aged 64. 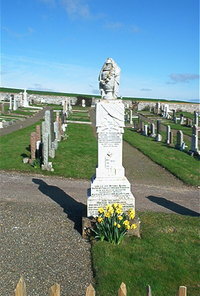 Son Mitchell Scobie died 15th February 1905 in infancy. Daughter Margaret McKay died 20th August 1916 aged 20. Daughter Elizabeth Henderson died 11th February 1917 aged 10. Wife Elizabeth Henderson died 26th May 1952 aged 85. Son Alexander D H Sutherland died 10th July 1960 aged 63. Daughter Helen H M Sutherland died 27th November 1927 aged 27. Husband Alexander Macgregor died 4th January 1960 aged 65.